This item is out of stock at this time. Polish Pottery Mugs are made of high quality stoneware. Each stoneware mug is hand crafted at famous Ceramika Artystyczna factory where artisans rely on time-honored techniques to meticulously decorate it by hand. The hand-painted surface is scratch resistant, durable, hygienic and easy-to-clean. 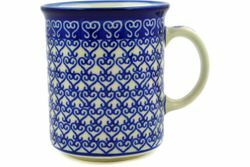 This colorful mug is sure to be a treasured part of your Polish pottery collection. This is a beautiful piece of Polish pottery.